Dell launched a new ultrathin laptop in China on Friday called the XPS 14z, which is slated to arrive in other markets later this year to take advantage of the coming holiday shopping seasons. 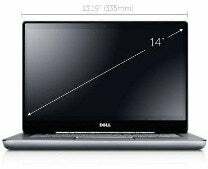 Dell is marketing the XPS 14z as the world's thinnest, fully featured laptop with a slot for a DVD drive. In terms of thinness, it measures 23 millimeters (0.9 inches) and is built with an aluminum case, making it resemble Apple's MacBook Pro line of laptops. The laptop has a 14-inch HD display screen with a resolution of 1366 x 768 pixels. Users can choose to buy Dell's XPS 14z with either Intel's second generation Core i5 or Core i7 processors. Dell claims the laptop has a 7-hour battery life. In China, the starting price of the laptop is 7,699 yuan (US$1,205). Dell is the world's second largest PC vendor. But the company is at risk of losing that position to rival Lenovo, which is the fastest growing among the world's top five PC vendors. Lenovo's chairman said earlier this month, he expects his company to overtake Dell in market share by the end of this year. While Dell's strength has been in the U.S. market, the company is focusing more on developing markets, said Tracy Tsai, an analyst with research firm Gartner. In Asia, 14-inch laptops have been the most popular among consumers, she added. However, the XPS 14z's price could be unappealing to most Chinese consumers. In Asia, PCs in the $600 to $800 price range tend to do best among mainstream consumers, Tsai said. Dell is launching its XPS 14z as PC vendors move toward selling more ultrathin laptops. At the end of May, chip maker Intel announced plans to push for a new class of thin and light laptops known as "Ultrabooks", in an effort to improve portable PCs. Dell said the XPS 14z is not an Ultrabook. The XPS 14z is, however, part of a trend by the PC industry to create more value with laptops and make the user experience similar to smartphones and tablets, Tsai said. Intel and PC vendors want to reduce laptop boot up times, give them longer battery life and also make the devices lighter, she added. "They are trying to inspire users to do more things on their PCs," she said. "I think that's the point of the ultrathins and the Ultrabook. It's a kind of evolutionary process. PCs are evolving to the next stage."